$Mon Platin Jojoba Hair Wax 150ml / 5.1oz Free Shipping Worldwide Styling - Apply to dry or moist hair and mold as desired Enriches hair and scalp with jojoba extract, protects healthy hair and scalp Appearance - for high sheen and wet look. Styling - facilitates long lasting special, mischievous styles Wellbeing - long lasting feeling of moisture and refreshing fragrance. Protection - jojoba extract protects hair and preserves its condition. Use - for daily use in styling. Jojoba Wax - unique wax based on jojoba extract and pure water for hair conditioning and hair dressing. Lands high gloss to the hair and keeps it healthy. Jojoba Wax is the result of innovative advanced development for healthy professional hair care Free Shipping Worldwide All our items are shipped as a registered air mail. International Delivery time 7-21 working days. $3 X Mon Platin Jojoba Wax 150ml / 5.1oz FREE SHIPPING WORLDWIDE Styling - Apply to dry or moist hair and mold as desired Enriches hair and scalp with jojoba extract, protects healthy hair and scalp Appearance - for high sheen and wet look. Styling - facilitates long lasting special, mischievous styles Wellbeing - long lasting feeling of moisture and refreshing fragrance. Protection - jojoba extract protects hair and preserves its condition. Use - for daily use in styling. Jojoba Wax - unique wax based on jojoba extract and pure water for hair conditioning and hair dressing. Lands high gloss to the hair and keeps it healthy. Jojoba Wax is the result of innovative advanced development for healthy professional hair care Free Shipping All our items are shipped as a registered air mail. International Delivery time 7-21 working days. $Mon Platin Professional - Hair Styling Jojoba Crystal Wax 250 ml FREE SHIPPING WORLDWIDE An exclusive, strong hold wax based on pure water and enriched with jojoba essence and grape seed oil, for perfect styling while strengthening hair roots. The result of a unique and innovative development process. Imparts high sheen and maintains healthy hair. Rinse off completely with water after use. FREE SHIPPING All our items are shipped as a registered air mail. International Delivery time 7-21 working days. We can ship trough EMS,DHL,UPS at extra cost. please contact us if you are interested. Same day shipment for all orders received before 02:00 PM. We will ship the package as a REGISTERED AIR MAIL, your signature is required. It is the responsibility of the buyer to handle any Taxes Costums fees or Duties in the receiving country. $Mon Platin Professional Black Caviar Total Repair Mask For Straightened Hair 500 ml FREE SHIPPING WORLDWIDE A treatment mask specially formulated for chemically straightened hair. Nourishes the hair with vital ingredients that may have been lost or damaged during the straightening process. Helps preserve the straightened result long-term. Does not contain any salts that are contra-indicated by the chemical treatment. Helps maintain the hair’s pH balance and adds moisture, flexibility, shine and vitality. Special anti-static formula based on a range of innovative silicones, enriched with extract of black caviar, olive oil, royal jelly and anti-oxidizing plant extracts (sea buckthorn, pomegranate and green tea). FREE SHIPPING We will ship your item within 1-2 days after your payment is clear. Jojoba Crystal Wax 8.5 OZ (250 ML). strong hold wax based on pure water and enriched with jojoba essence and grape seed oil, for perfect styling while strengthening hair roots. The wax's natural formula including grape seed oil not only provides hold but enriches the hair, keeping it looking gorgeous from application to removal. Whether it's developing a beauty care line to help skin reach its full radiant potential. Or creating products that transform hair into what is truly a crowning glory - Mon Platin can answer the most demanding criteria. $Mon Platin Professional Black Caviar & Silk Protein Hair Mask 500 ml Based on a unique formula for the prevention of static, comprising a mixture of exclusive, innovative silicones, olive oil and silk protein, combined with royal jelly and plant essences (pomegranate and green tea to prevent oxidization). Also unique to this complex are essence of black caviar and oil of obliphicha, which interact to form the latest and most effective treatment for damaged and colored hair. $Mon Platin Professional Black Caviar Total Blonde Hair Mask 500 ml FREE SHIPPING WORLDWIDE Nourishing and moisturizing treatment mask for blonde, bleached or lightened hair. Helps preserve purity of color. Contains no salts and is compatible with straightening treatments. Helps balance the hair’s pH levels and leaves hair shiny, rich, supple and vital. Special anti static formula based on a complex of vitamins and black caviar extract, enriched with olive oil, royal jelly and anti oxidizing plant essences (obliphica, pomegranate and green tea). FREE SHIPPING We will ship your item within 1-2 days after your payment is clear. I will ship the package as a REGISTERED AIR MAIL, your signature is required. It is the responsibility of the buyer to handle any Taxes Customs fees or Duties in the receiving country. 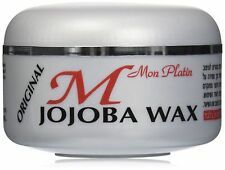 $Mon Platin Professional Jojoba & Black Caviar Aqua menonly Styling Wax 280 ml FREE SHIPPING WORLDWIDE An all-new formula based on pure water and extract of caviar and jojoba Extra strong hold and lasting sheen Contains extract of jojoba and black caviar Helps maintain healthy hair texture FREE SHIPPING We will ship your item within 1-2 days after your payment is clear. I will ship the package as a REGISTERED AIR MAIL, your signature is required. It is the responsibility of the buyer to handle any Taxes Customs fees or Duties in the receiving country. If you have any questions feel free to contact us !!!. 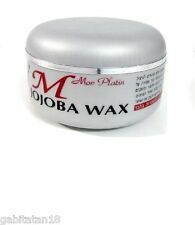 Mon Platin Jojoba Wax, 150 ml. strong hold wax based on pure water and enriched with jojoba essence and grape seed oil, for perfect styling while strengthening hair roots. Jojoba Crystal Wax 8.5 OZ (250 ML). Usually quicker. Why buy through us?. Have an issue?. Usually quicker. LOW PRICE! Why buy through us?. Have an issue?. An exclusive mask designed to blend and disguise any yellow tones in blond hair and/or streaks and/or highlights. Leaves hair soft and supple, with added sheen and vitality. Exp 05/2021. Total Clean shampoo intensively cleanses the hair shafts and scalp, removing the dandruff. Enriched with argan, obliphicha (sea buckthorn), and macadamia oils. Combined with argan and macadamia oils plus special ingredients for nurturing the scalp, including aloe vera, chamomile, and vitamin B5. 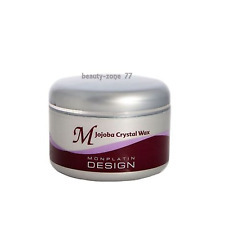 (250ml (each)) - Jojoba Crystal Wax 8.5 OZ (250 ML). Mon Platin. Size : 250ml (each). 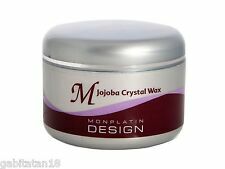 (Jojoba Crystal Wax 8.5 OZ (250 ML)). Add to Favourites. New Arrivals. Other Information: D02. Health & Beauty. Hair will be thoroughly enriched and reliably held in a manner few products can accomplish. Helpful Links. The Dead Sea?s most precious resource famous for thousands of years, comes to you in a totally pure state. Containing a huge range of highly concentrated minerals to smooth on your body, it enhances and protects your skin, keeping it young looking and safe from environmental hazards. It removes excess oil and dead cells from the skin surface. Its deep cleansing action refreshes and revives your skin. Capacity: 500grl. Brand new in box. About DSM: The DSM product line created by Mon Platin scientists, is formulated for all those who value nature’s role in comprehensive skin care. $Mon Platin Professional Oriental Oil 100ml FREE SHIPPING A complex of oils and silicones enriched with argan oil, jojoba oil and wheat germ oil and containing Vitamin E. Provides maximum protection to hair during the drying process, enhances appearance of the hair and adds sheen and richness. Also effective for protection against weather damage and split ends. Adds shine and vitality to the hair. FREE SHIPPING We will ship your item within 1-2 days after your payment is clear. I will ship the package as a REGISTERED AIR MAIL, your signature is required. It is the responsibility of the buyer to handle any Taxes Customs fees or Duties in the receiving country. If you have any questions feel free to contact us !!!. Mon Platin Professional 12 in 1 Multi Action Hair Cream black caviar 250 ml. Multi-Action Hair Cream Enriched with Black Caviar Extract 250 ml. Enriched with black caviar extract. Protects against heat. Sensuous Texture :Leaves hair feeling silky soft. Makes combing and use of hairdryers and straighteners easier. 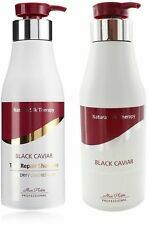 Hair-Repair Conditioner enriched with Black Caviar Conditioner for intensive care, enrichment and nutrition of hair. Contains extracts of black caviar. Enriched with vitamin B5 and intensive anti-oxidants (orange and pomegranate extracts), combined with macadamia, obliphicha, and argan oils that protect and add shine and strength to your hair. Vol.13.5fl.oz/400ml. Brand new in box. 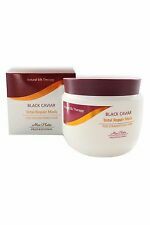 Mon Platin Black Caviar 12 in 1 Multi Action Hair Cream 250ml FREE SHIPPING WORL. Condition is New. Shipped with USPS Priority Mail.